Sequart Organization is proud to announce the publication of Bright Eyes, Ape City: Examining the Planet of the Apes Mythos, edited by Rich Handley and Joseph F. Berenato. With those horrified words, Charlton Heston’s Colonel George Taylor summed up exactly what viewers were thinking in 1968 the first time they saw Planet of the Apes in theaters. Loincloth-clad humans reduced to mute savages, living in cages or in the wild? Xenophobic orangutans, militaristic gorillas, and curious chimpanzees with a rigid class structure, Greco-Roman names, religious dogma, and the ability to speak and reason? What goes on here? It’s a madhouse! Audiences were hooked — and they remain hooked almost five decades later. Planet of the Apes (based on Pierre Boulle’s French novel Monkey Planet) has spawned eight films, with a ninth currently in the works, as well as two television series and several novels. It’s one of the most respected franchises in pop-culture history, thanks to the talents of writers Rod Serling, Michael Wilson, Paul Dehn, John and Joyce Corrington, William Broyles Jr., Rick Jaffa, Amanda Silver, and Mark Bomback; directors Franklin J. Schaffner, Ted Post, Don Taylor, J. Lee Thompson, Tim Burton, Rupert Wyatt, and Matt Reeves; makeup artists John Chambers and Rick Baker; and a long list of beloved actors who have breathed life into some of the most memorable science-fiction characters ever to grace the large or small screen. Bright Eyes, Ape City: Examining the Planet of the Apes Mythos, edited by the same team behind Sequart’s Sacred Scrolls: Comics on the Planet of the Apes, examines every Apes film, TV show, and novel, from 1968 to present. This anthology features insightful, analytical essays about the franchise’s long history, from popular film historians, novelists, bloggers, and subject-matter experts. If you’re eager to learn more about Apes lore, then you’ll need to get your stinkin’ paws on this book. The book runs 308 pages and features a foreword by David Gerrold. 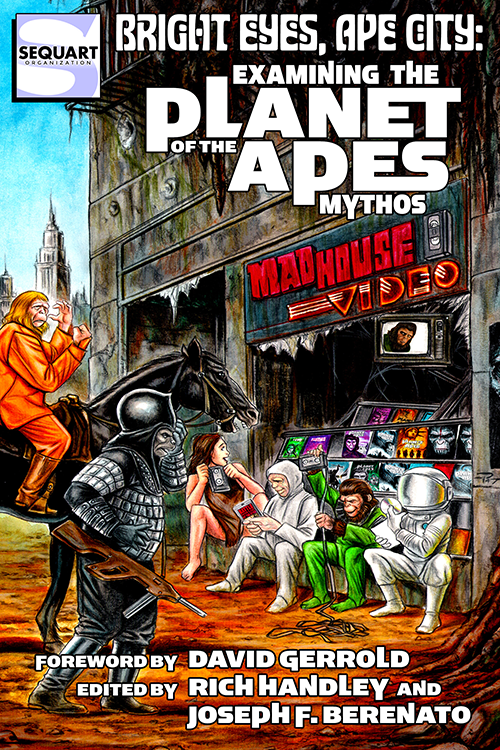 Bright Eyes, Ape City: Examining the Planet of the Apes Mythos is available in print and on Kindle. (Just a reminder: you don’t need a Kindle device to read Kindle-formatted books; you can download a free Kindle reader for most computers, phones, and tablets.) Find out more on the book’s official page or its Facebook page.